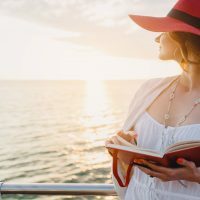 Originally known for its “fraternity” atmosphere, Carnival Cruise Line has grown up in recent years, evolving into a family-friendly cruise line with better cuisine, high-quality children’s programs and diverse itineraries to new parts of the world. Carnival Cruise Line is the largest in the world and, founded in 1972, it has been around long enough to know what makes a good cruise. In total, Carnival has a fleet of 24 ships. 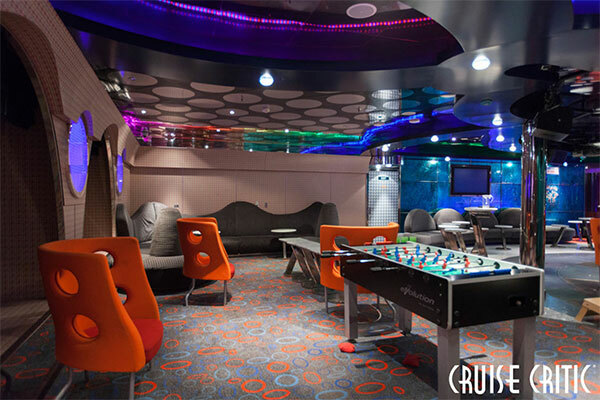 The newest ship, Carnival Vista, offers a Family Harbor with a dedicated family zone, lounge and family suites. Carnival Vista offers a 4,000-square-foot Camp Ocean kids’ club for children ages 2 to 11, two outdoor playgrounds, thrilling onboard entertainment and activities for older kids and adults, and much more. The cruise currently sails in Europe and will begin servicing Miami cruises in 2017. Carnival Fantasy-class ships were first introduced in 1990, including Carnival Fantasy, Carnival Ecstasy, Carnival Sensation, Carnival Fascination, Carnival Imagination, Carnival Inspiration, Carnival Elation and Carnival Paradise. These Carnival ships have water parks, kids’ clubs and miniature golf courses. Similar to Fantasy-class is Spirit-class, which began with Carnival Spirit in 2001. 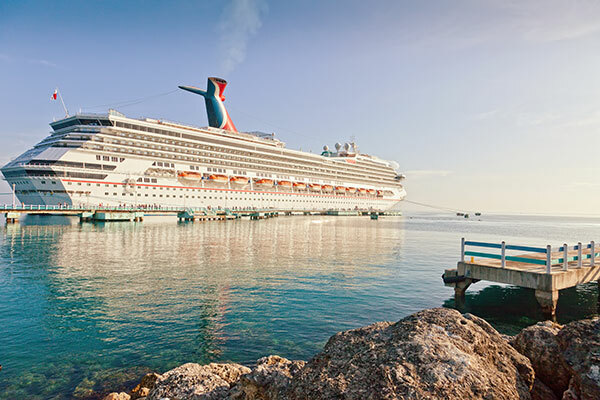 Other Carnival ships include Carnival Miracle, Carnival Freedom, Carnival Pride and Carnival Legend, and the new Carnival Fathom, launched in 2015. Fathom is the first cruise dedicated to providing cultural volunteering programs. Fathom is also the first American cruise to offer voyages to Cuba for Americans, where guests will work on educational and cultural exchanges. 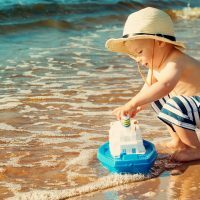 From the sandy beaches of Hawaii to the jungles of Cozumel to the glaciers of Alaska’s Inside Passage, beautiful destinations are fun for everyone in the family. Currently, Carnival Cruise Line travels to the Caribbean, Bermuda, Mexico, Hawaii, Alaska, Canada and New England and, most recently, Europe. To ensure that all family members enjoy the time at port, Carnival offers excursions and activities, like city tours or snorkeling outings. Carnival offers a wide range of trip itineraries, with cruises offered as little as three days or up to 16 days. Carnival professes that half of all states in the U.S. are within a five-hour drive from a cruise line homeport. Located along the western, eastern and southern boarders, the following are some popular Carnival ports: Baltimore, Charleston, Fort Lauderdale, Los Angeles, Miami, New Orleans, New York, San Diego and Seattle. 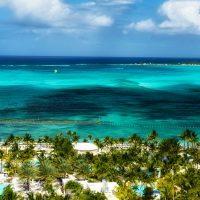 Related: Are Carnival Cruises From Close-to-Home Ports Worth It? Typical rooms offer a “Comfort Bed” sleep system that contains plush mattresses, posh duvets, soft linens and fluffy pillows. Suites also feature pillow menus for upgraded pillow selections. The original fleet, Carnival Fantasy-class ships, has recently been upgraded to including flat-screen televisions, new carpeting and modern furniture. Kids will delight in the towel-folded animal that greets them upon return from their day’s activities. Larger families can opt to stay in family-friendly staterooms, which can accommodate up to five people. Offering more privacy and space, family-friendly staterooms are essentially two rooms connected with a door. Newer ships, like Carnival Splendor, also offer spa cabins for families looking for relaxation and decadence. 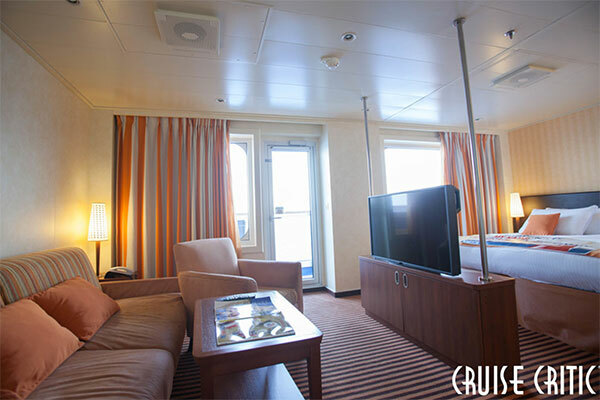 These ships also have spacious accommodations that will make you feel as if you’re not on a cruise. Carnival Dream features ocean-view cabins with two bathrooms that sleep up to five people. Typically, suites offer bathtubs. Holiday cribs, portable and folding, are also provided free of charge. The new Vista Family Suites are located in the Family Harbor, a dedicated family zone with 96 extra-large family suites that can accommodate five guests. These suites have two bathrooms with kid-friendly toiltertries and kid-sized bathrobes and slippers, as well as a separate sleeping area for parents and children, so parents don’t have to go to sleep when little ones do. As part of the Family Harbor, guests also receive access to the Family Harbor Lounge, free meals for kids 12 and younger, and a free kids’ night activities program in Camp Ocean. Note: Third and fourth people sail for reduced rates on Carnival, which benefits most families. As the cruise line has matured, Carnival’s food has become better and better. The cruise line offers traditional, sit-down meals at 6 and 8:15 p.m. but also offers a more flexible eating schedule, called “Your Time Dining,” in the dining room, between 5:45 and 9:30 p.m. More casual dining and buffets allow guests to eat at any time of the day. Usually, ships also offer themed eateries, like Asian buffets, New York delis and complimentary sushi bars. Spa Carnival also serves health-conscious meals that are low in sodium, fat and cholesterol. The Chef’s Table experience is a dining attraction not to be missed. This program offers a multicourse dinner with the master chef, a private cocktail reception and a tour of the galley. There is an extra fee of $75 per person (adult or child), but it may be worth it to a family of foodies. Lido Deck Dining are buffet dining areas that keep it casual for families and allows meals to be eaten alongside the ocean. Outdoor dining on the deck is available at any hour of the day. The kitchen never closes and you can eat as much as you want. Children’s menus offer spaghetti and meatballs, hotdogs and pizza. Each ship has a European-style cafe that serves all sorts of tea and coffee variations. Buffet selections feature a diverse salad bar, a meat-carving station and many desserts that will more than satisfy your sweet tooth. Room Service is also available 24/7 and great for families who are too tuckered out from their busy day, or who want to sleep in late and lounge around. Carnival allows families to tailor their vacations with as much, or as little, activity throughout the day and evening. With all the optional classes, activities and events, there’s no excuse for boredom. Guests can take napkin-folding classes, tour the kitchens or participate in belly-flop contests. Ships have many pools, and some hide one pool under a retractable roof, so it can be used year-round. Water parks and miniature golf courses are a couple other kid hotspots on deck. Carnival cruises with kids are completely doable. Unlike other cruises, Carnival offers children’s programs in a variety of age groups, so your child will never feel too young or too old, while at play. Children at Camp Ocean split into three age groups between ages 2 and 11: Toddlers (2 to 5), Juniors (6 to 8) and Intermediates (9 to 11). Certified staff members supervise, while kids do crafts, have story time, play board games and romp around outside. Childcare includes kid-friendly meals, like macaroni and cheese. Carnival Vista features a new 4,000-square-foot Camp Ocean for kids 2 to 11. The play area includes a common area, a crafts zone, two outdoor playgrounds and more. Circle C is a program especially for ‘tweens ages 12 to 14 years old. Kids have their own hangout in the Circle C room, usually decorated with an artsy, chic vibe. Here, they can mix and mingle while playing video games or attending dance parties. Pool parties, scavenger hunts and sports events are also arranged in other parts of the ship. Club 02 is a teens’ center for kids between the ages of 15 to 17. Teens can meet new friends or simply hang out at the Club 02 Lounge, which hosts dance parties, video gaming, sports and karaoke. Teen-only shore excursions also take place when you pull into port. Select ships, including Carnival Freedom and Carnival Liberty, feature the Seaside Theater — an outdoor movie shown on a large screen by the pool. Like Princess Cruise’s “Movies Under the Stars” program, this one lets passengers tune in to news, concerts, sports games and movies throughout the day and night. Waterworks, Carnival’s onboard water park features spiraling slides, side-by-side race slides or a swirling DrainPipe slide, depending on which ship you are aboard. Carnival Vista has the first IMAX Theatre at sea, with a three-deck screen and 182 seats and the new SkyRide, which is like a bike high in the sky that zips over the ship’s decks and over the sea. In 2014, Carnival launched a Dr. Seuss-themed program called Seuss at Sea. Dr. Seuss Bookville provides a family reading and play venue, while Seuss-a-Palooza Parades and Storytimes provide entertainment. A special character breakfast with the Cat in the Hat and Friends, featuring Green Eggs and Ham, of course, is also available. Carnival’s ships all offer Internet cafes with private computer stations. Wi-Fi access is available in all public rooms and areas, as well.